PowerPoint presentation – "Human rights in action"
This projects aims to connect students of similar age from different countries by sending and receiving a travelling teddy bear. Each class that participates in the project sends its class teddy bear or a mascot to a partner country. Partner country teacher organizes activities with teddy bear that include taking photos with teddy bear in different parts of partner` s school, writing and describing their school, their hometown and country, writing introductory letters to partners, making short videos about themselves , making presentations, drawings and many more. Travelling teddy bear is a kind of tool that motivates them to do varios activites using foreign language. The aims of the projects are enhancing students` motivation in foreign language learning and improving their writing , speaking, listening and reading competences , as well as ICT comptences both of students and teachers. Cooperation everyone will grow profesionally and personally. This project will enable students of various age to see the real benefits of learning English language . Working on the project will make every day teaching more enthusiastic, dynamic and creative and it will bring new teaching methods in classes. Furthermore, other aims of the projects are connecting students and the whole classrooms from various countries, getting to know each others cultures, educational system, habits, likes and dislikes. The project will start in February 2016 and it will last until June 2016. All partners will receive a schedule with planned activities and will have to be constantly in touch to coordinate activities. First step is to determine which coutry sends their mascot and which country receives it. There will me more mascots, each country sends theirs. When they receive the mascot, students take pictures with it within their school, describe those photos and write introductory letters. Some pupils can take it home and take photos with the mascot at home and describe their typical day. All the partners will collaborate in planning . We will use emails and Skype to communicate and Twinspace as well, forum. Each partner school teacher will coordinate his/her class of pupils and it is optional whether there will be teams of pupils or the whole class. The expected outcome are materials uploaded to Twinspace and improved language skills and pupils´motivation. We expect to upload all the produced material: pictures of letters, drawings, presentations, short videos, online meetings. We expect this project to bring joy and improvement in all areas of professional life. We expect to learn from each other and to share our knowledge, especially in the use of web 2 digital toolas and ways of sharing produced material. Collaborationa and coordination skills as well as ICT skills will be impoved among teachers included in this project. Na poziv Učiteljskog fakulteta Sveučilišta u Zagrebu, IV. 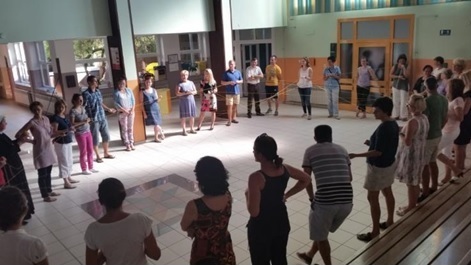 osnovna školu Varaždin uključit će se u projekt Lifelong Learning Programme Comenius „A Resilience Curriculum for Early and Primary Schools in Europe (RESCUR)“. RESCUR je trogodišnji LLP Comenius project (2012-2015) čiji je glavni koordinator Sveučilište na Malti, a sudjeluje još 5 europskih sveučilišta. Učiteljski fakultet zadužen je za razvoj aktivnosti koje se odnose na unapređivanje komunikacijskih vještina. S ciljem razvijanja kvalitetnog priručnika, pilot-projektom koji će se provoditi na IV. OŠ će se provjeriti ostvaruju li se predviđenim aktivnostima očekivani ciljevi i ishodi učenja te jesu li one napisane na način koji je prihvatljiv učiteljima te samoj djeci. Edukacija za uključene učiteljice od 1. do 4. razreda provest će se u petak, 14. studenog. Aktivnosti eTwinning projekta Listen out of the jukebox. Učenici 7. a sudjeluje u tome projektu. Partneri projekta su Italija i Grčka.